And now, possibly because I’ve already had a coffee stout, the lyrics “We all live in a beer submarine, a beer submarine, a beer submarine” are stuck in my head! That’s a really cool gift, BTW! so fancy. We only have beer keg. (02-06-2019, 09:18 PM)Super Wrote: What is a 'torp'? It’s short for torpedo; a sort of “mini keg” you load into the subl that ooks a bit like a plastic soda bottle. Here in the US, you have to buy them from a specialty retailer and I’m only aware of one seller on the West Coast. This seller seems to deal primarily in microbrews from California and of course, the beer has to be shipped, which leads to other issues like whether you can legally have it shipped to your state. It’s a neat idea but the market isn’t very mature in the US right now. It's quite new to the market in the UK as well, the Subs are only available directly from the site run by Heinken and of course Amazon (you can get anything there hehe), similarly the beer torps are only available from those sites too as far as I know. But its a good service, typically 1-3 days from Heinken and they come from Holland to the UK, Amazon of course is Prime so next day. Where do you get the Beer from and in what form? In the photo it looks like too much head, is there adjustments or was it how the pilsner was held? The beer comes in the form of 2ltr plastic containers with a valve on each end. Packed in the cap is a small connector tube with a pipe on the other end. Once inserted in the Sub the beer is chilled to 2c and as you pour it pressure is applied to ensure all the beer comes out of the container during use. In that instance it was the first glass out of a new container so you do get a bit more head than you'd expect, if you pour it carefully normally at 45 degrees etc... you can get it better. However in Europe the norm is to have a big head on the beer like that - bit of a fiddle if you ask me to make you buy more in a bar lol! 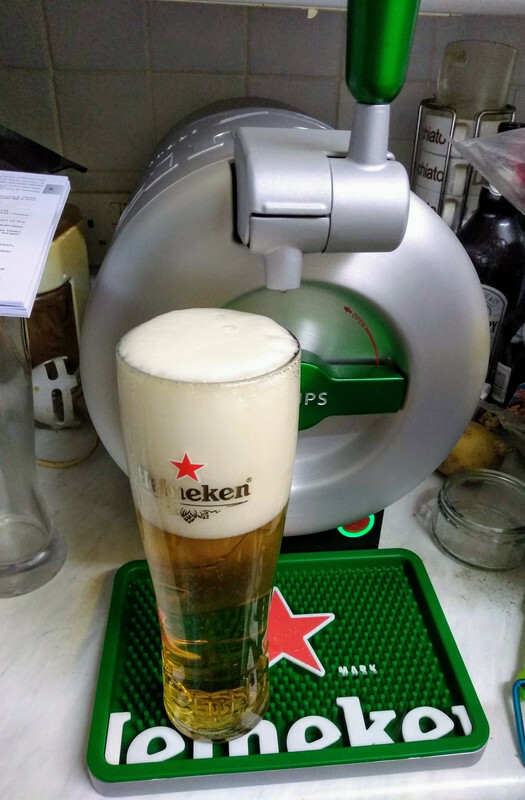 In my younger, Beer guzzling...err...sipping days, I hated going to a bar and ordering an 'On Tap' brew and it coming with anything more than 1" of head. There was nothing worse than looking forward to a refreshing cold glass of beer only to get the first two mouth fulls of foam.